Benign Gynaecology, Early Pregnancy Bleeding, Pregnancy Care (Antenatal, Intrapartum/Birthing and Postnatal Care). 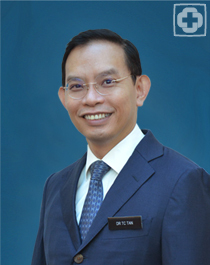 Associate Professor Tan Thiam Chye is Head of Department and Senior Consultant for Department of Obstetrics and Gynaecology in KK Women’s and Children’s Hospital. He also holds the appointment as Deputy Education Director for the hospital. He is the founding Clerkship co-ordinator for Obstetrics and Gynaecology Clerkship in Duke-NUS Graduate Medical School. He was awarded the inaugural SingHealth Golden Apple Award for Outstanding Educator in 2011 and Pioneer Award for 2013. His research interest is in Reproductive Endocrinology in First Trimester Miscarriage. He was awarded the NMRC/MOH Industrial Aligned Fund (IAF) Research Grant $1.2 million for his research work in miscarriage biomarkers in pregnancy for 2016-2018. He was granted SGD $1 million under the NMRC-ZIKA Medical Research Grant for A Multi-Center Prospective National Longitudinal Study on ZIKA. He co-authored the book “Practical O&G Handbook for the Clinician and General Practitioner” which was awarded the prestigious British Medical Association Book Award in 2015. Prestigious British Medical Association Book Award in 2015. Ku CW, Tan ZW, Li M, Tam ZY, Tan TC, Tan NS. Spontaneous miscarriage in first trimester pregnancy is associated with altered urinary metabolite profile. BBA Clinical 2017;8:48-55.